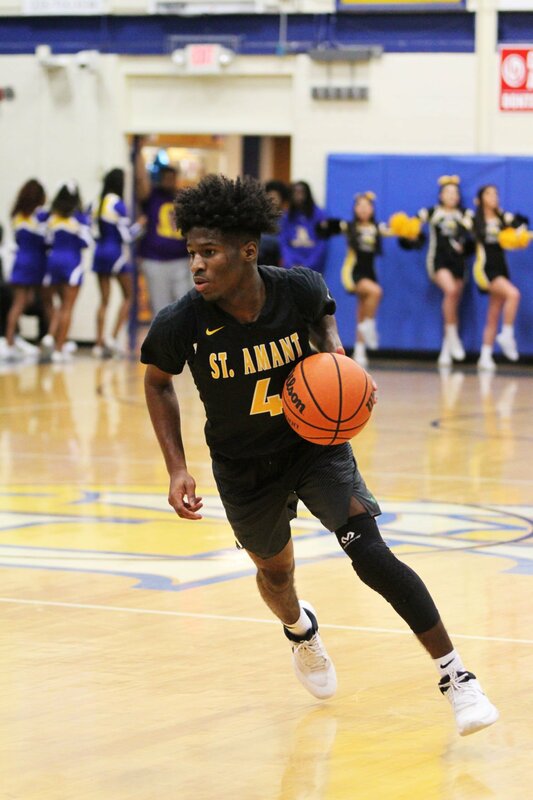 St. Amant's K.J. Franklin moves the ball around against East Ascension during the match up held at East Ascension High during a recent game. 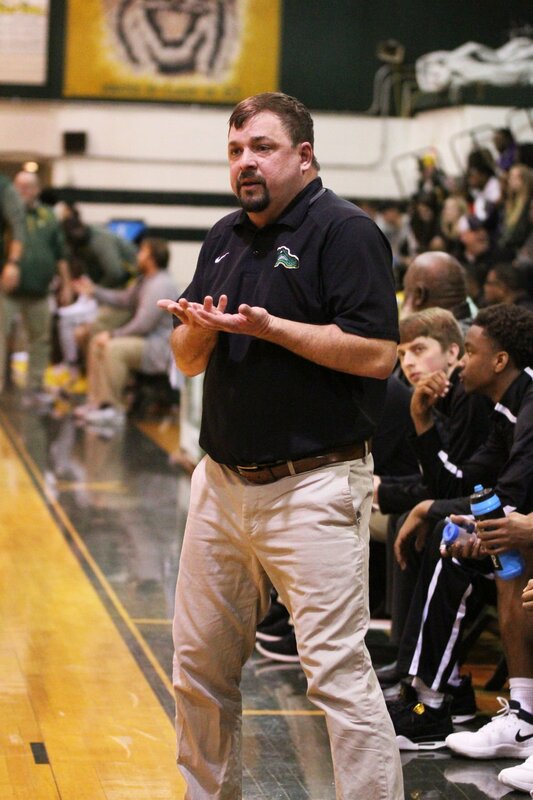 The St. Amant Gators boys basketball team is 18-8 and coming off an emotional 64-58 win over parish rival Dutchtown, but coach Travis Uzee knows his team must continue to play hard and strive for excellence. “I am very proud of my team's focus and the work they have put into getting better each day,” Uzee said. Uzee is in his sixth year as the head coach, with a district championship capping his fifth straight winning season last year with a solid 23-11 record. The Gators have had some impressive wins this season including victories over Donaldsonville, Comeaux, University and Terrebonne. Leading the Gators are dual-sport standout K.J. Franklin, Destin Barker and Troy Dunn. “K.J. Franklin averages 13.5 a game and has 1,400 points in his career; he is our leader,” Uzee said. Barker is the leading rebounder with an average of 9 per game, and Dunn, a freshman, leads in assists with an average of five per game. The Gators have used several different lineups due to injuries and other reasons. “We are deep this year because we have been forced to play several younger guys due to injuries; we have only played eight games with a healthy roster," Uzee said. The Gators have only two seniors and have been starting a group of juniors, a sophomore and a freshman. “The young guys are starting to figure it out," Uzee said. "We have won 10 of the last 12 games and picked up a huge win over a very good Dutchtown team this past week." District play is beginning, and the Gators know it will be very tough. “Catholic High is likely the favorite, but every team in the district is tough; no easy games,” Uzee said. As the final two weeks of the regular season wind down and the playoffs approach, striving for excellence remains the goal. “It has been a challenging season due to the injuries and playing younger guys, but this group is resilient; we are looking forward to the home stretch," Uzee said.